The Burlington Youth Soccer offers a wide variety of youth soccer programs throughout the year. All of our programs are divided into our main three seasons: Summer (May - Aug), Fall (Sept - Dec), & Winter (Jan - Apr). 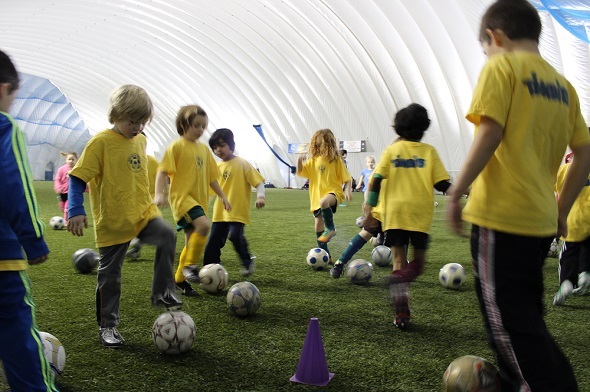 During the Fall & Winter seasons all of our programming is run at the BYSC Domes at Sherwood Forest Park. The foundation of our youth programming is our Recreational House League, which has been a staple in Burlington since 1962 and is offered in all three seasons. Our youth program begins at the U3 level and includes boys and girls divisions up to U19. Outside our the House League program, we have worked hard to expand our program offerings to suit the needs and desires of the Burlington soccer community. We have a full spectrum Camp program that offers parents a soccer alternative for those breaks from school, including: Summer Camps, PA Day Camps, & March Break Camps. We have also expanded our supplemental training offerings through the School of Soccer, which offers specialist training in the areas of Goalkeeping, Striking, 1V1, Essentials, & Futsal (Fall/Winter). More recently, we have added specialty programs for toddlers (18 months - 3 years old) to learn physical literacy, Lil' Burli Program, and a program designed for children with physical and mental developmental disabilities, Embracing Ability (in partnership with Special Olympics Ontario).